(647) 559-1764 Click For a Free Estimate! 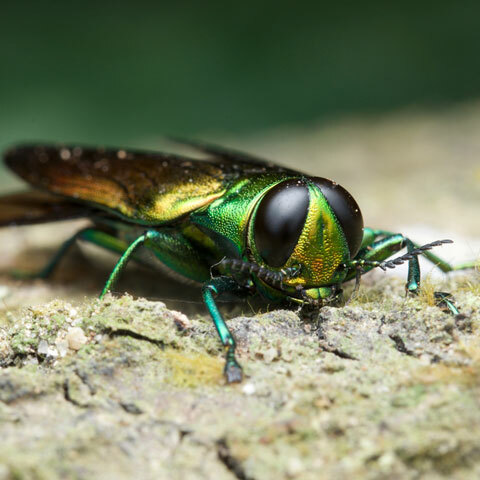 Known as a beetle that kills, the shiny green and destructive Emerald Ash Borer is a major problem when it comes to Ash trees in eastern North America. Arborists say that Emerald Ash Borer has been invading Ash trees since 2002 with no signs of stopping. These pests travelled from their homeland of Asia and found their new home in the Ash trees in residential backyards and forests. This invasive Emerald Ash Borer insect burrows into the bark of the tree and leaches the nutrients from the tree eventually killing it and rendering the area unsafe. Our trained arborists will guide you through proper compliance. Arboreal work can be dangerous for both people and their property. The goal is to keep the neighborhood's trees healthy. When your trees show signs of disease or Emerald Ash Borer infestation, be sure to call Twelve Oaks Tree Service, you're local tree doctor to get the job done right. The team at Twelve Oaks knows exactly which procedure that your tree will need and can help solve your Emerald Ash Borer issues. Symptoms that could mean you have an Emerald Ash Borer infested tree are evident loss of foliage, discoloration in the summer time and small holes around the trunk of the tree. If your trees display these symptoms, call Twelve Oaks Tree Service to inspect the problem. Emerald Ash Borer is a Beetle that will inhabit any Ash tree in its path. The best course of action after first sign of infestation would be to have the trees removed to help prevent exposure to the beatles. Servicing Toronto and the GTA! We are a family owned and operated passionate team of professionals. As hands-on owners and operators, we will be on site from the time of the call including when your property is serviced, inspected and cleaned. Choose Twelve Oaks, with over 15 years of arboreal experience you can guarantee that your request will be completed efficiently and effectively. Don't take a risk when it comes to your home and your assets. For more information regarding Emerald Ash Borer infestations give us a call today at (647) 559-1764. © 2019 - Twelve Oaks Tree Service Inc.